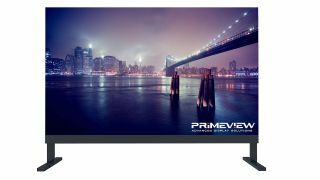 Primeview's new line of turn-key LED includes flexible, Full HD (1920x1080), 16x9 aspect ratio standard, bezel-free panel display. The What: Primeview has unveiled its latest display innovation – the Primeview Fusion MAX Display (FSNM) Solutions. Primeview's new line of turn-key LED includes flexible, Full HD (1920x1080), 16x9 aspect ratio standard, bezel-free panel display. The What Else: Available in 110”, 138”, 165” or 220" models, the displays feature scale-able building block LED that can be installed in a wider variety of spaces for maximum impact of executive boardrooms, classrooms, simulation, retail, customer experience centers, and private theaters. The Bottom Line: The building block of the Fusion Max Series of turn-key LED solutions are the Fusion Line of new LED. This is comprised of front-serviceable Fan-less cabinets from 1.2mm, 1.5mm, 1.9mm and 2.5mm LEDs. All Fusion LED comes standard with 3-in-1 Integrated Board Design (Power, Receiving Card & Bridge-board), 100k hours rating, 160/160 wide viewing angles, pedestal or wall mountable framing accessories, optional multi-touch (coming soon) and no-hassle 5-year onsite parts and labor warranty. In early Q1 2019, Primeview will be releasing UHD 4k versions of Fusion MAX. “Since 1997, Primeview has become a brand recognized globally for quality and reliability in mission critical and broadcast 24/7 applications. Today, Primeview Fusion MAX takes a completely new approach to truly seamless direct-view LED walls and opens the market for mass adoption. After nearly one year under development, we have practically redesigned and optimized every component in efforts to drastically reduce installation time, ease-of-servicing, and improve reliability, all while making the solution affordable for the mass-market across all verticals and markets,” said Shay Giuili, CEO and founder of Primeview Global.